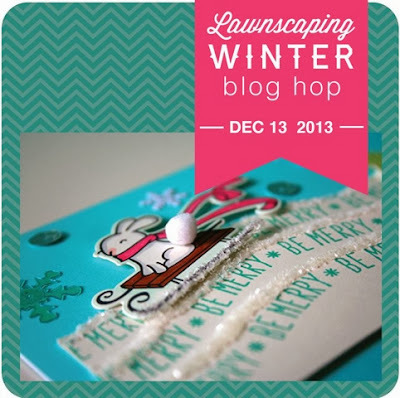 Today I have the honor to be part of the Lawnscaping Winter blog hop, when I knew about it I was so excited because I love their challenges and of course I’m a #lawnfawnaddict lol. The blog hop is filled with amazing crafters so you will have tons of incredible ideas and inspiration. You should have arrived from the lovely & very talented specially with sequins :] Paulina Nakamura, but if you get lost you can go to the Lawnscaping blog for the entire list of designers. The theme is winter, so I pulled out all my Lawn fawn stamps and think what I can do with them and this idea appeared in my head. 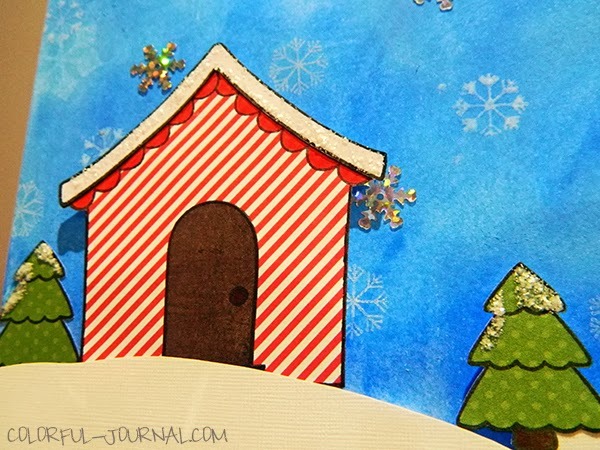 I used the gingerbread house in the Sweet Christmas stamp set to make cute little village houses. This is the first time ever that I used distress inks in this way it was a little hard because it didn’t look as the cardmakers pros lol but I know with practice and more videos I will be doing ok the next time. Then I stamped the house in some cute Peace Joy Love patterned papers, this paper pad came days ago from a Simon Says Stamp order, phew! I’m glad it came so I could use it. 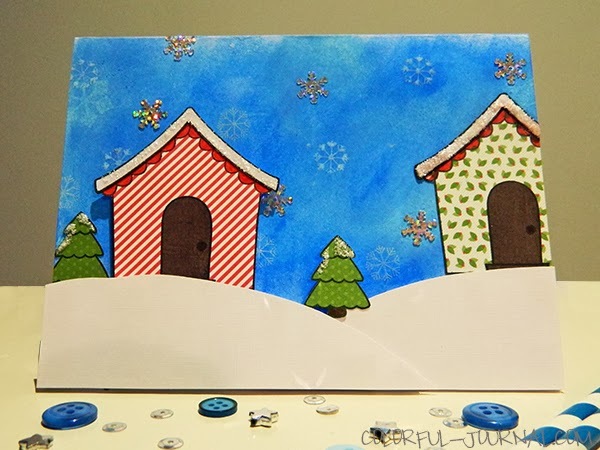 After all the stamped pieces were cut, I adhered the house in the right then one snowy hill with foam squares, the other house also with foam squares and for the last snowy hill I used double foam squares to create more dimension. 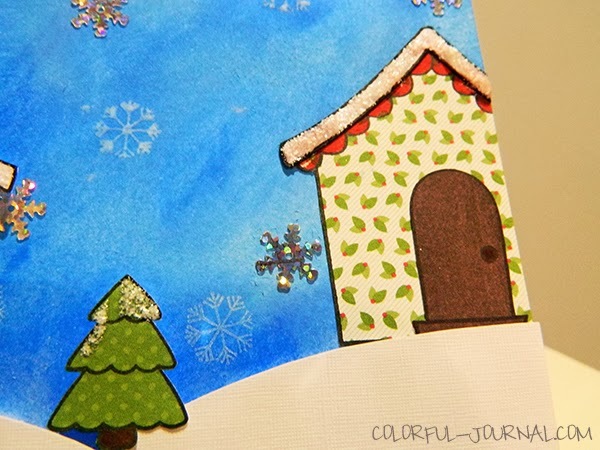 I love details so I used stickles as snow in the trees and the roofs of the houses, snowflakes sequins to give the card a little bit of shine. Inside the card I stamped the sentiment that was: Sending you warm wishes . Now the fun part, Prizes!!! Leave some love in each blog so you can have more chances to win. If you want to see the amazing prizes go to the Lawnscaping blog. Good luck, hope you had fun here and if you want to continue looking at my work you can follow me in any of my social media accounts or subscribe to received email on my blog. 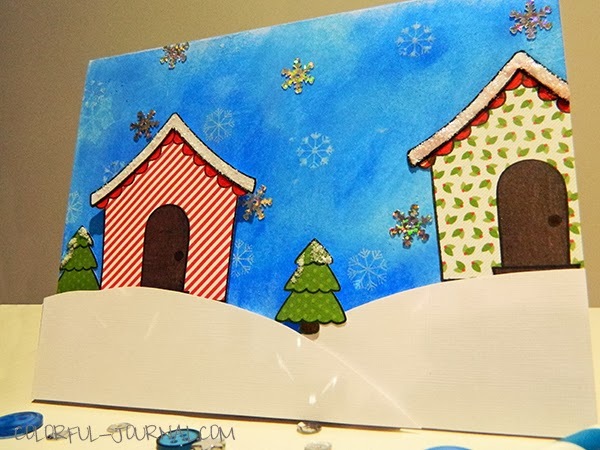 Your next stop in the blog hop is Lyndal she always have amazing cards go check her. Cute card and great first try at using the distress inks! Those are so much fun, you’ll get addicted to this technique! Love your little village. It looks a bit like it is at the beach. That is where we spend our Christmas in Australia. Great work. 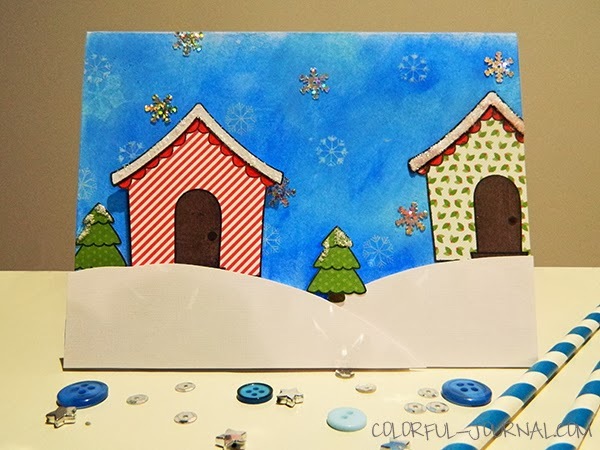 Love the scene, and all the cutting… I don’t quite have the patience for it which is why I love dies and my Cuttlebug!!! What a sweet little scene!! I LOVE the different patterns you used!! THANKS for sharing and have a Fabulous Holiday Season!! Fabulous card! I love the patterned houses!